The effective limit on the size of the MSR proposed by Council is an extremely welcome strengthening of the EUETS. 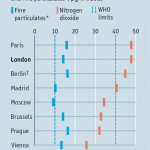 However it will still take a long time for the EUETS to become fully effective. This post updates last week’s post to reflect the important agreement on the EUETS reached in Council earlier this week. On Tuesday the Environment Council endorsed more ambitious EU ETS policy changes than those agreed by the European Parliament. This surprised many observers (including me) and is a very welcome change. The most important change is an effective limit on the size of the Market Stability Reserve (MSR). 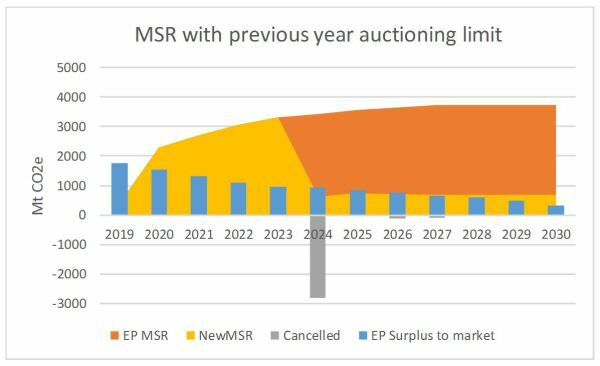 Allowances held in the MSR will be cancelled if the MSR contains more than the previous year’s auction volumes, although the precise interpretation of this remains to be defined. In effect this change means that the number of allowances in the MSR is unlikely to be more than about 500 -700 million after the limit takes effect in 2024. Indeed the volume limit is tighter than I had previously expected to be possible when I was advocating a size limit on the MSR last June (see here). The huge size of the MSR during Phase 4 means that this reform will likely result in a cancellation of about 3 billion tonnes from the MSR over Phase 4 (see chart). 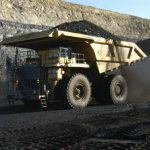 Much of this 3 billion tonnes will go into the MSR in 2019, and will be cancelled in 2024 if the reform is finally adopted. Despite this proposal the market is likely to remain weak for a long time. Emissions will remain below the cap until the middle or the end of the next decade, and perhaps for longer. 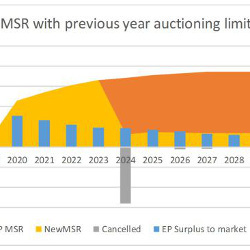 Volumes are not in any case likely to begin returning from the MSR until close to 2030, so the size limit will probably begin to bite in the 2030s. Tightening the cap to reflect actual emissions remains essential for a well-functioning EUETS over the next few years, and additional measures to complement the EUETS will continue to be necessary (see my previous post for more on these points). Indeed this reform increases the value of additional action as it implies that additional surplus allowances will indeed be cancelled, leading to greater reductions in cumulative emissions. Nevertheless, despite its limitations, this reform is a substantial and very welcome strengthening of the EUETS. Even though the market will still take many years to tighten, this reform is likely to have some influence on earlier prices as traders anticipate a tighter market. Indeed, in contrast to the measures coming out of Parliament, the market responded immediately to the vote (prices temporarily increased €1/tonne, about 20%). It is highly desirable that this reform is retained through the remainder of the legislative process. Thanks to Boris Lagadinov at Sandbag for useful discussions and providing the chart for this post.